Researchers Hope To Improve Vision By Injecting Semiconductor Specks Into Your Retinas | OhGizmo! By Andrew Liszewski on 12/23/08 • Leave a comment! 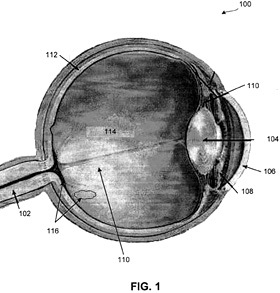 The idea of creating a bionic eye to assist people with seriously impaired vision is definitely exciting. But installing a silicon chip into a human eyeball to assist the retinas has some drawbacks, the least of which being that the chip itself can block light from falling on areas of the retina that are healthy and still working properly. So Jeffrey Olsen at the University of Colorado Hospital has come up with a different approach. Instead of implanting a single large chip, he wants to inject quantum dots, or nanoscale sized pieces of semiconductor into the retina. They fluoresce when hit by photons and would actually serve to boost the image hitting the damaged retina, improving its ability to interpret the image. Not only do the quantum dots not require an external power source, but they’re extremely small and can actually be targeted towards specific areas of the retina that are damaged. So in other words, you can send help where it’s needed most. So far the technique has shown promise when tested on rats, and you can read the patent application on the WIPO website for more specifics.